Take the JR Joban Line from Ueno Station and get off at Ushiku Station. From the West Exit, take the Kantetsu Bus bound for Tsukuba Center, Tsukuba-Daigaku-Chuo, Yatabe-Shako, or Seibutu-Ken-Owashi and get off at Nougyo-Kankyo-Gijutsu-Kenkyusho-Mae. Take the Tsukuba Express Line from Akihabara Station and get of at Midorino Station. Take the Kantetsu Bus ‘Norin-Danchi-Junkan’ and get off at Norin Danchi Chuo. 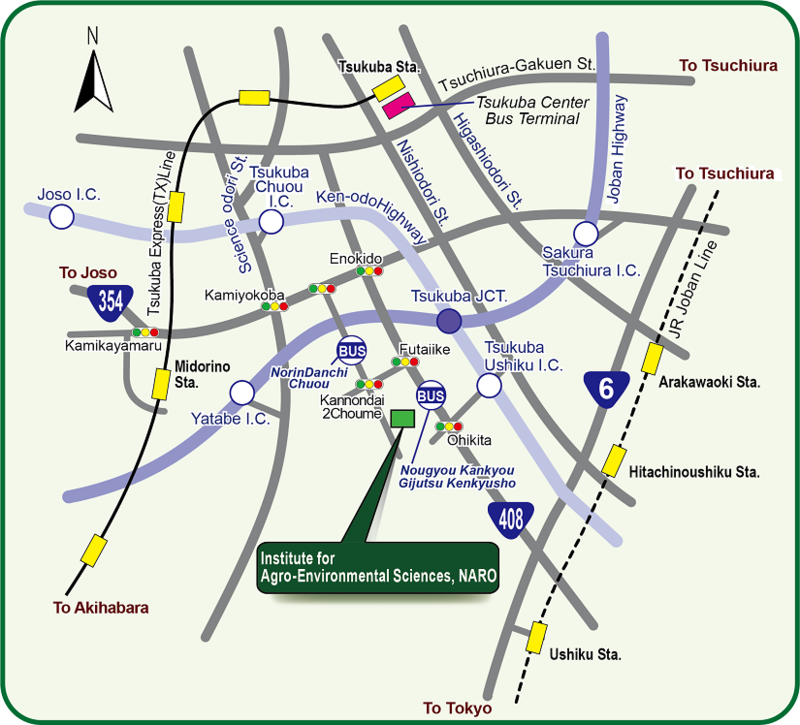 Take the Kantetsu or Keikyu Bus bound for Tsukuba Center and get off at Tsukuba Center (in front of Tsukuba Station). Take the Tsuku Bus ‘Nambu Shuttle’ and get off at Norin Danchi Chuo.